Recently I met up with a journalist named Gloria who writes for a religious magazine. 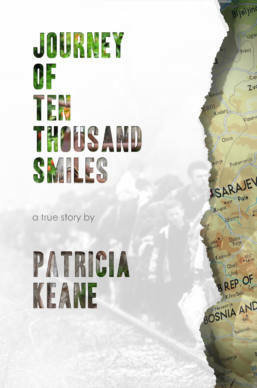 Within moments of chatting it was obvious that Gloria had read my book, Journey Of Ten Thousand Smiles. “I hope you don’t mind me saying this, but you don’t stammer anymore.” In chapter two of the book, I write about my stammer and the handicap it presented for forty years of my life. My stammer blocked many opportunities and held me captive in a shy and insecure self. I was angry when I couldn’t read or speak in public, frustrated to the point of tears. “You say in your book that you knew you weren’t born with a stammer, that you developed it in childhood. Tell me more about that”, Gloria said. I shared a memory about going into the classroom when I was about six years of age to tell my teacher that two boys were fighting on the playground. “What’s happened to you? You can’t speak” the teacher said. I was terrified of her as she had bouts of angry outburst ensued by physical punishment, and of course, that included me. I had problems learning Irish, retaining spellings, and reading and I suffered much because of the learning difficulties. Going to school was torture for me mentally and emotionally, and I used to feign a lot of sicknesses and would pretend to faint or run to the loo when it was my turn to answer questions. My stammer got worse and got I angrier”, I explained. Surrender yourself to God so that He may hear you, console you and forgive everything inside you which is a hindrance on the way of love. In this way, God can move your life, and you will grow in love. Bitterness had hardened my heart, but in those moments reading her message I decided for love. How could God help me if I wasn’t prepared to forgive others? I began with admitting to Jesus that I didn’t want to forgive, but with his help, I would commit to praying for the grace of forgiveness. I cried for the next two years, but my tears were the release of childhood traumas that had built up inside of me. I began to recognise how fearful I was, how I avoided confrontation, and how weak I was as a person. I learned that I constantly looked for approval from empty sources. I was a people pleaser and allowed myself to be taken advantage of, and then I got angry over that. I woke at night with inner trembling, and I saw that my stammer was worse when I felt nervous. I was full of insecurities and had covered it up for years by being a work alcoholic and a high achiever. One day in prayer I said to the Lord, “I’m slowly killing myself”, and that was the turning point in my life. I promised Our Lady that I wasn’t going to cover up my feelings any longer. I sat down with a very dear priest friend and shocked him when I revealed how much my inner being hurt. At his suggestion I went to daily Mass, received the Eucharist, I examined my conscience, and when I had done wrong, I went to confession. I prayed the three rosaries every day, recited the Divine Mercy Chaplet, set up a Divine Mercy Prayer Group in Moore Abbey, Monastervin and observed how easy it was to fall back into bitterness, jealousy and envy. Every few months I saw improvements. My trust in Jesus had grown enormously, and my anxiety had lessened. Praise be Jesus and Mary. This entry was posted in blog, Mary my Mother. Bookmark the permalink.